↑ "Circulation and readership profile" (PDF). 2011. ↑ Worms, Laurence (2004). "Wilson, Effingham (1785–1868)". Oxford Dictionary of National Biography. Oxford University Press. Retrieved 2015-10-01. 1 2 3 "Railway periodical literature". steamindex.com. ↑ "A new force in transport publishing". 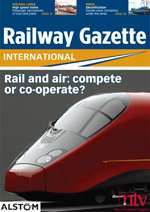 railwaygazette.com.